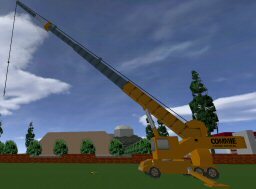 This lite class crane is useful for general purpose lifting, and could prove useful for construction sites, seaports, and various industry related builds. Because of the high object count, it's recommended you place the base object inbetween two cells. 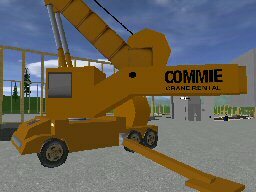 This will be the crane's center (about where the driver sits). Rotation is possible with a bit of work. Select the slide the bottom half (below the pivot mechanism) of the crane out the way, a couple cells over. Then select the remaining upper half and rotate. Then slide the bottom back into place. The upper half's pivot point will move around during the rotation so you may want to mark it with a temporary object to know where it belongs.